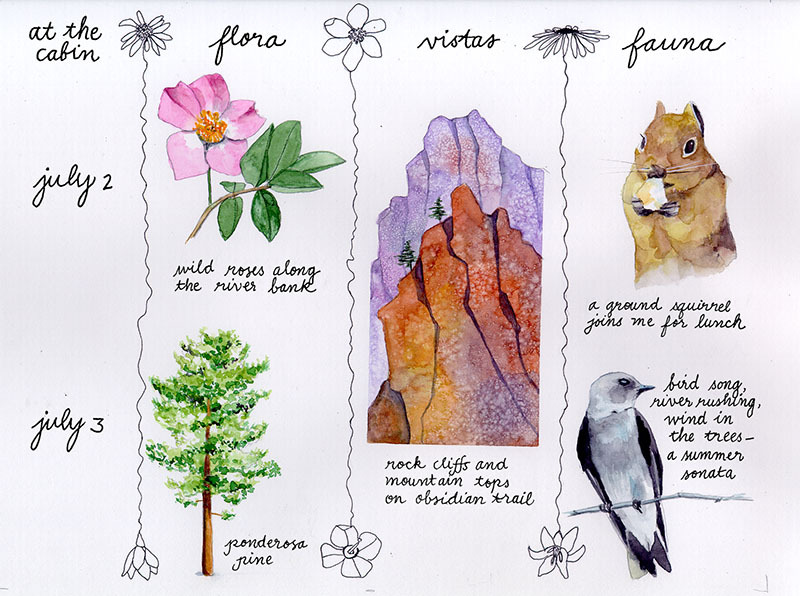 Shelley Washburn teaches and writes in Portland, Oregon, where she shares her love of the natural world with students of all ages. Shelley wrote this piece using the lessons of Art Escapes to come up with three journaling activities for children, and she has kindly given her permission for it to be shown here. This fun, quick activity is what Dory Kanter calls "one minute drawings." Have your students draw six squares on a journal page (or you can buy a stamp for them to print these) and then take them out to the garden. Tell kids to choose an object or scene and let their eyes do the drawing. That is, they should keep their gaze on the object more than on the paper in front of them—no erasing or worrying about what it looks like. This is, as Dory says, the art of the rough sketch. Time the students as they do a fast pencil sketch in one of the boxes. You can start out with thirty-second drawings to warm them up and then move on to one-minute drawings. A minute can seem like a long time when you are looking carefully. 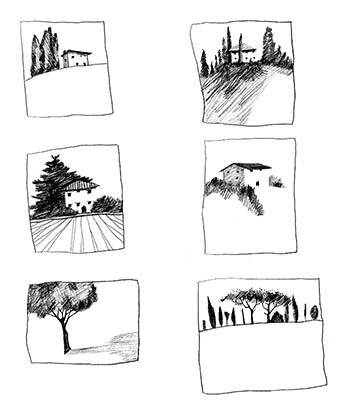 The small-frame format is good for sequential drawings—little vignettes from one side of the garden to the other or from the top of a plant to the bottom. Ask your students to title their page. What words best sum up their experience? Next, add one-minute writings to this activity. In every other box, have the students write descriptions of what they just finished drawing. Encourage them to add to their visual observations by using their other senses. What do they hear, feel, smell? Have them write for one minute or until the box is filled. A garden offers so many interesting things to explore—leaves, insects, seeds—that it might be hard for students to choose what to write about. The matrix framework is one way to help students focus on a few things in the garden and create an order in which to write about them. Ask your kids to write three topics across the top of a journal page. (You can offer a list to choose from or students can come up with their own based on their experience of the garden.) Topics could be "lupine seeds," "ants," or "dirt." Other topics could be more abstract: "weather," "colors," or "places for insects to hide." As long as students use their senses to write their descriptions, they should have enough specific information to work from. Have students evenly space their topics with vertical lines between them, forming three columns on the page. Now your kids are ready to observe and note what they see. Encourage them to both draw and write in the columns, so that they end up with pictures and words under each topic. a . . . ." These pieces can be short. Your students only need to write a few sentences about each topic to get the full benefits of this activity. Older students or more skilled students could create a separate paragraph for each topic in the matrix. In the process of taking their descriptions to final draft, your students will learn to group like ideas, use transitions, and, ultimately, to express their observations clearly and well. 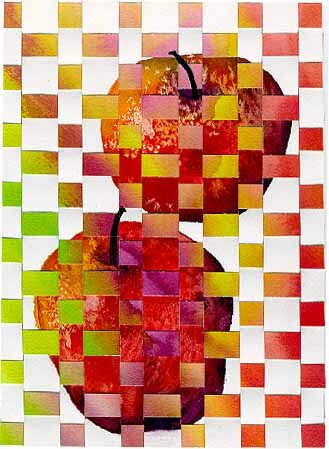 Dory Kanter has added a new twist to the old grade school paper weaving project by adding watercolor paintings to create collages. You can do these with whatever kinds of color media you have: tempera paints, crayons, or watercolors. Students love these. Paper weavings can be any size. They can fit into journals or you could even buy watercolor postcards for kids to paint as gifts for others. No matter what size, paper weavings become a metaphor for the intersection of art and writing, the physical and the mental, the earth and the spirit. 1) Hand out good, heavy drawing paper and colors. Have your students either paint in the garden or in the classroom using objects from the garden. These paintings or colorings can be abstract or not. Students could try to capture the impression of the garden in simple bars of color across the page or they could actually draw a representation of the garden or something in it. Whatever they do, have them fill the entire page with color. 2) Instruct your kids to cut vertical strips in their painted sheets leaving an uncut band at the top, about an inch thick. If you have young students you might need to put tape across the top to prevent them from cutting through. These strips can be cut into even widths or they could be alternately thick and thin. 3) Give your students a second page and have them cut these into horizontal strips all the way through so they have pieces to weave with. 4) Your students can now weave each horizontal strip into the cut painting. Alternate rows beginning over and under, then under and over. If kids have cut different widths in their second page, they can alternate these as well to create a pleasing pattern. 5) Tape the backs of the collages along the edges to keep the strips from unraveling. 6) Now ask students to go through their journals and find words that relate to their paintings and write these on the unpainted squares. The words could be randomly placed or could fit together like the lines of a poem.